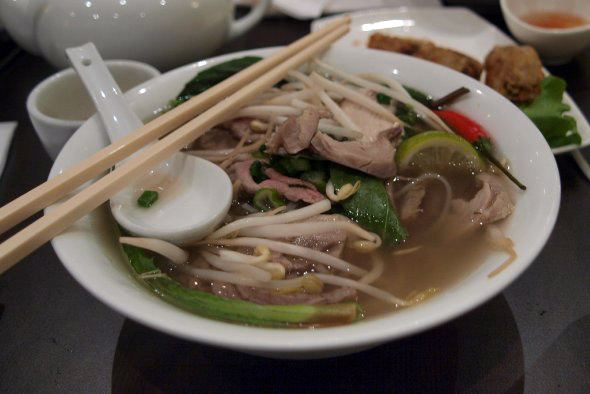 Pho Huong, on the corner of Pacific Ave and Dundas St W, is a local hot spot in the Junction . While somewhat hidden away this 'authentic' Vietnamese restaurant is always bustling at mealtimes with families, groups of friends, and people stopping in for a quick meal. In my case, I'm making the trip on a rainy evening for some comforting broth to lighten up a long, hard day. My best friend and I walk in to Pho Huong and are motioned by a busy server to take a table at the back. The restaurant is brightly lit and well kept, only having opened just over a year ago. The decoration is tastefully simple but the tables themselves are of the gets-the-job-done genre typical of pho restaurants. Each has a little station with tableware, utensils, and a wide array of condiments. My friend's a regular and I've been there a fair share of times myself so we both quickly get to work jotting down our orders. 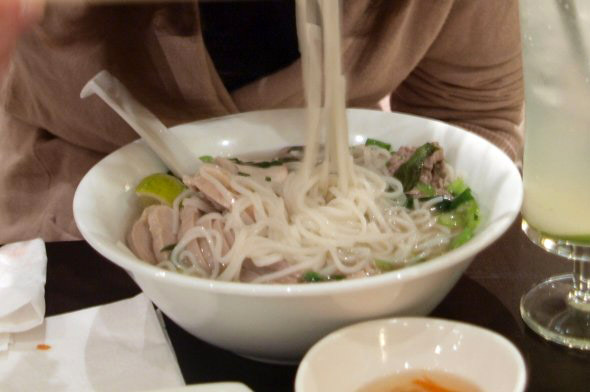 Skipping over the Rice, Vermicelli, and other dishes, we go straight for the pho. While the others are good, especially the Vermicelli, we know that the Pho is the real star here and we're too tired to mess around. Despite our practiced efficiency, the tea arrives to our table before we've finished writing out our orders. We add on some drinks and spring rolls before our slip is picked up by one of the servers, who checks it over with a brisk nod and walks off. The spring rolls ($3.75) come quickly. I pick a piece up, using a napkin to protect my fingers from the piping hot oil, and gingerly bite in. The shell is crispy and the filling tasty. My friend is famished, so I let her take the lion's share as I finish my piece and wait for the pho. I don't have to wait long - the two bowls, huge though they're technically the "small," are deftly placed before us, accompanied by a plate of fresh bean sprouts, herbs, lime, and chilis. I generously season my bowl of rare beef and chicken with noodles ($5.95) with the herbs while my friend opts to leave her bowl of chicken with noodles ($6.50) as is. I work on my lemon and sugar with soda ($3.00) while I wait for the meat to fully cook in the broth. 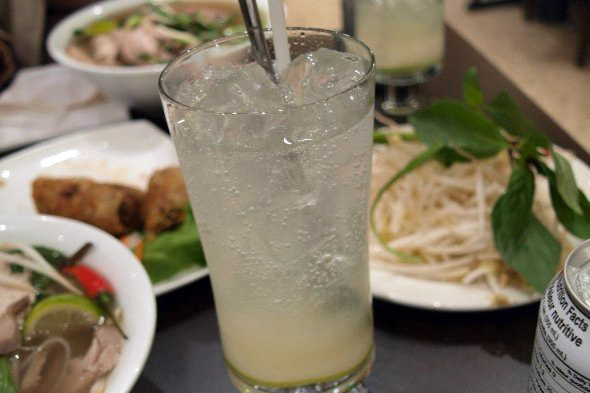 While Pho Huong offers a wide variety of freshly made fruit smoothies, I enjoy the clean simplicity of the very fresh and very sour fizz. Finally we dig into our pho bowls gracelessly, the long noodles dangling out of our mouths as we awkwardly attempt to bite them short. I'm rather convinced that someone better trained could do this with more dignity, but don't bother myself too much over it. The noodles are good and the meat is fresh, but it's the broth that's the reason I'll wander all the way to the junction for my pho. Made fresh daily using the owner Hanna's home recipe, it's complex and flavourful; it always reminds me of a comforting hug, putting the world back into perspective as each sip helps wash away my cares. While the service is no-nonsense, there is no sense of rush to finish our meals. We take our time, sometimes chatting, sometimes just watching Hanna's three little girls run around the tables. Finally we flag down the bill and head back out into the pouring rain, our souls a little warmer than before. Pho Houng is open from 10am to 10pm Sunday through Thursday, and 10am to 11pm Friday and Saturday. 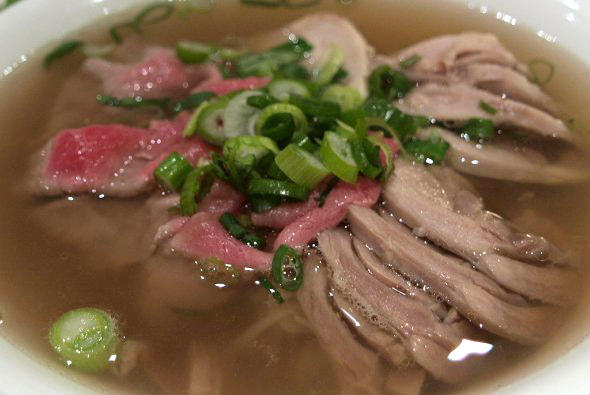 Dishes range from $6-$8 typically, pho coming in small (pictured above), medium, or large. They offer takeout and delivery.